ZIMBABWE – Leader of the Movement for Democratic Change (MDC) Morgan Tsvangirai came out lambasting Robert Mugabe’s Zanu PF for Zimbabwe’s “grim economic and social reality”. During the unveiling of the Without Reforms No Elections (WReNE) document, Tsvangirai said Zimbabweans can’t even afford to buy bread. “We meet in the context of a grim economic and social reality in which families are struggling to just survive, at a time when a simple loaf bread has become a symbol of luxury and affluence,” said Tsvangirai. “The millions of vendors making a living on our streets by selling anything capable of being sold are the true human expression of the extreme national suffering characterising Zimbabwe today,” he added. Tsvangirai has also lashed out at the labelling of Zambezi fishers as poachers, arguing that this is the only way the said fishers know how to survive. “I was in Binga two weeks ago and I saw the desperation of the people, with citizens there being branded “poachers” for fishing in the Zambezi, the only means of survival they have known throughout their entire lives,” he said. The leader of the MDC claims to have travelled the whole of Zimbabwe, observing the poor living conditions of the people. “In Chipinge, Mudzi, Lupane and Gwanda, I saw a people on their knees, struggling to make a living in an economy that has simply collapsed. Of course, the party in government is certainly on another planet, seemingly oblivious to the desperation in Mbare, Makokova, Chipinge and Gokwe,” he said. Tsvangirai said Zimbabweans are wondering whether Mugabe was still living in the country. “Closeted in his delusional world, Mugabe had the audacity to tell us that the economy is registering “modest growth”, leaving the nation wondering whether the President was still living in this country,” he lashed out. 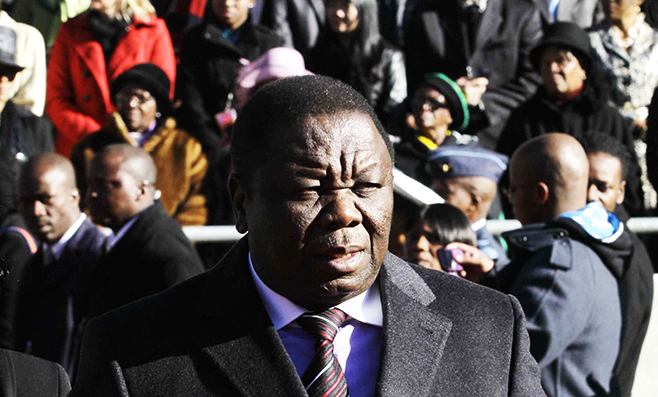 Tsvangirai blamed the poor economic conditions in what he alleges were stolen 2013 elections. Thus, he called on “discerning Zimbabweans to return to legitimacy”, which he claims “can only happen if the people are allowed to express themselves in a credible election”.